Mama Mummy Mum: What Happened To The Traditional Nativity? What Happened To The Traditional Nativity? Although the memories definitely aren't as clear as they used to be, I will always remember my first Nativity play at school. I got the best part, oh yes, I was a mouse. I know what your thinking, a really important role, I even got to squeek as I scurried about with a tail pinned to the back of my trousers. It was the traditional story about Mary and Joseph and how baby Jesus came to be born. We sang songs like little donkey and it was a time for the parents to come and see there children in action. Since having my own children, going to watch them perform in their own Nativity plays has been something I have really looked forward too, I come to think of it as a real part of our build up to Christmas. 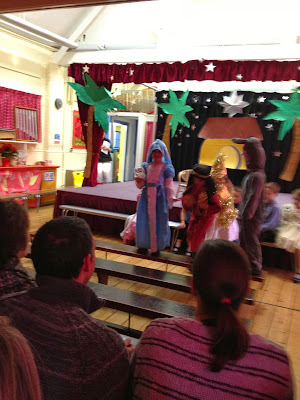 I was a proud mummy last year when Elise was picked to play the part of Mary. However as happy as I was to see my daughter up there acting her little heart out I can't help but come away feeling a little disappointed every year. The focus doesn't seem to be on the original story of the giving birth of Jesus anymore, it is more about putting on a big show. Half the songs they sing these days I don't even recognise, they are not the old ones we know and love, most are made up to the tunes of different nursery rhymes. Gone are the days when every child seemed to get a some what meaningful role to play, last year some of the children in my daughter's school got to play rocks and trees, since when did these objects play a part in the Nativity?? Personally if I was a mum of one of those kids I would have been really upset for them. This year the primary school that my eldest two daughter's attend aren't even putting on a proper Nativity play let alone classic one, they are just doing some little bits during their school's Christmas church service, we've been given a week and halfs notice to sort out a costume for our children. Freya is again breaking tradition slightly because she wants to be a shepherd and I'm not sure how many female shepherds there were way back when? What do you think, should Nativity plays move with the times or would it be better if they stick with the convential story? I kind of agree my kids are not at school yet but I have a sister who is and her plays are all about school and taking the mick out the teachers and nothing to do with the message of Christmas and many of the jokes the kids don't understand. I only go every year to not let her down but I'm never impressed with the plays themselves I hope when my two go to school they will get to do proper nativities because I think they are cute! My kids school does a nativity play in the infants - but once they go to the juniors it gets a bit strange. This year my son's 'Christmas' performance is Mary Poppins!